At MWC 2015 in Barcelona, Sony unveiled the Xperia Z4 Tablet, the successor to the Xperia Z2 Tablet (yes, we know Sony doesn't seem to know how to count). It is currently the world's thinnest and lightest tablet. The ultra-thin 10.1-inch tablet is now widely available and we took it for a spin. Our Sony Xperia Z4 Tablet review examines its features and specs against its asking price and evaluates whether or not you should consider buying one. The Sony Xperia Z4 Tablet release date was June 17, 2015. The Sony Xperia Z4 Tablet price (with LTE) is set at 579 GBP via Sony's UK online store, but that includes the Bluetooth keyboard by default. The Wi-Fi-only version with no keyboard can be picked up at Amazon in the UK for 499 GBP. An official US price for the Xperia Z4 Tablet has not yet been announced although unlocked international models are available on Amazon for as little as 599 USD (Wi-Fi) and 699 USD (LTE). As soon as you see the Xperia Z4 Tablet you'll be surprised by how thin it is. Once you pick it up though, you'll be amazed by how thin and light it is. Weighing in at just 393 grams, the Z4 Tablet is 46 grams lighter than its predecessor: that's more than 10 percent lighter. The Xperia Z4 Tablet is also a pleasure to hold. The back of the Z4 Tablet is a matt plastic with a nice feel to it, kind of like the Nexus 9 but with far fewer fingerprint smudges. In terms of design, Sony has stuck with its familiar Omnibalance design language. So there's not much here you wouldn't have seen already. The power button and volume rocker are located on the left side, while the micro-USB port is located on the right side. The upper edge of the tablet has a headphone port on the far left, followed by a water-proof flap for the microSD card and SIM. Although the micro-USB and headphone jack are exposed, the Xperia Tablet Z4 remains dustproof and water-resistant to IP65 and IP68 standards. The corners of the Z4 Tablet have the same rubber ''bumpers'' we saw introduced on the Xperia Z3. On the back, the 8.1 MP camera is located in the top right hand corner alongside the NFC chip. The dual front-facing speakers on the front of the tablet sit slightly below halfway and the top bezel houses a sensor and front-facing 5.1 MP camera. A notification LED is hidden over the right hand side. 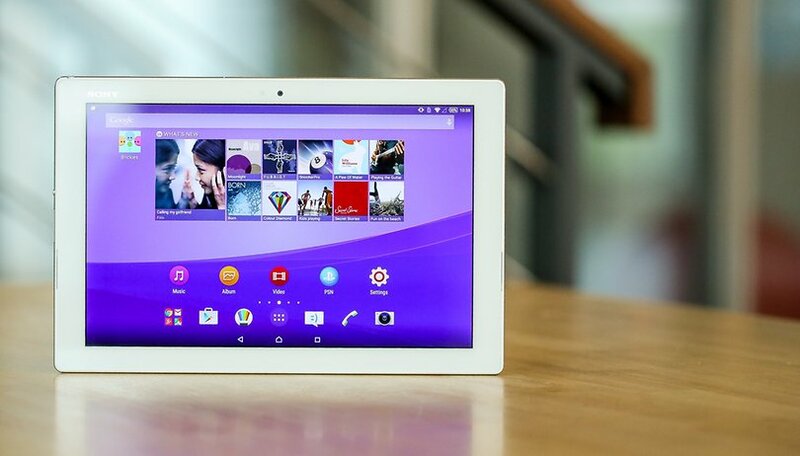 If you're a fan of Sony's design language then you'll be pleased with the look of the Xperia Z4 Tablet. If you were hoping for something different you'll be disappointed. But whether your expectations were met or not, there's no denying the Xperia Z4 Tablet is one of the best looking tablets around right now. The overall impression given by the Xperia Z4 Tablet is very consistent and of high quality despite the massive use of plastic. The Sony Xperia Z4 Tablet features a 10.1-inch QHD display (2,560 x 1,600 pixels) with a pixel density of 299 pixels per inch. That's not a super sharp screen by anyone's standards but it is a nice one. Sony's IPS LCD uses ''X-Reality for Mobile'' to bring colors and contrast to their optimum level. The Z4 Tablet display is not only sharper than the Z2 tablet, but it also much brighter. The stability of the viewing angles is beyond doubt and it is a true pleasure to use the Z4 Tablet. To be sure, the sharpness is not there compared to many smartphones (or other tablets for that matter), but it just goes to show what you can do with a lower-resolution display when you get what it displays just right. One of the most obvious Sony Xperia Z4 Tablet features is its water-resistant and dustproof rating. While this is a standard among Xperia Z series devices, it is still quite unique amongst Android devices in general. Whether you take the Z4 Tablet's IP65/IP68 certification as an invitation to play games in the bathtub or not, the good news is you can run it under a tap when it gets dirty (and of course, it can withstand getting dirty in the first place). One of the best things about this feature is that the Z4 Tablet is a perfect outdoors companion, from the beach to the park to getting caught in rain. The Xperia Z4 specs are not quite up to laptop standards, but that hasn't stopped Sony from making the Z4 Tablet fully compatible with an additional keyboard, complete with track pad. It functions via Wi-Fi and the tablet can be slotted in, much like an Asus Transformer tablet or the Microsoft Surface. Snapping the keyboard on instantly turns the Z4 Tablet into a laptop-style device that is great for typing on for long stretches of time. The Bluetooth keyboard also functions as a cover for the tablet. In the UK it is bundled with the tablet by default but in other European countries it is sold separately for 179 EUR. We're not sure what will happen when the Z4 Tablet hits the US market. The Sony Xperia Z4 Tablet runs Android 5.0.2 Lollipop out of the box with Sony's Xperia UI. But, unlike the design of the tablet itself, the user interface is actually a little different to what you may already be familiar with. The Z4 Tablet interface is well adapted to Google's Material Design language for recent versions of Android. In fact, some elements of the interface are left almost untouched from stock Android. The notifications shade, for example, has just the tiniest bit of Sony flair in the use of icons, otherwise it's pretty much what you'd get on a Nexus 9. Sliders, buttons and Quick Settings options are all pretty much stock too, but with some minor changes and additional functions. Sony's app icons are now flatter and brighter too. You'll get the usual suite of Sony apps to complete the software experience, including the fun augmented reality mode that lets you throw 3D dinosaurs on your tabletop or have fish swim around your desk. Fortunately, the processor overheating we experienced on the Xperia Z3+ when using AR modes is not present in the Z4 tablet. A general reminder about overheating comes up, but even after several minutes no heat warning or force close occurs. The now-infamous Qualcomm Snapdragon 810 processor comprises the core of the Sony Xperia Z4 Tablet specs. While this CPU has been much-maligned this year for overheating problems and thermal throttling (where the CPU's performance is restricted to limit overheating), the 810 in the Z4 Tablet does not suffer the same fate. This leads us to believe the Z4 Tablet ships with the Snapdragon 810 v2.1. It's not such an easy process to discover which version of the Snapdragon 810 a device is running, as both have the same model number for the chip. The v2.1 has a slight increase in GPU clock speeds from 600 MHz to 630 MHz, and our Z4 Tablet has a 600 MHz GPU. This would seem to indicate a v2 810 and yet we're not seeing any overheating or throttling problems. We've reached out to Sony for clarification. From a performance standpoint the Z4 Tablet is one of the most powerful currently on the market. In AnTuTu benchmarks, the Xperia Z4 Tablet posts very high scores of almost 59,000 points. For reference, the Nexus 9 hits 53,000 and the Nvidia Shield 57,000 (both these latter two devices use the Nvidia Tegra K1 CPU). While we didn't see any force closes or crashes during testing due to overheating, the Z4 Tablet does still get quite warm under stress, particularly in the area near the NFC chip. Fortunately the Z4 Tablet has a much larger chassis with which to dissipate heat than the smaller Z3+ smartphone. Hot spots on the Z4 Tablet tend to cool down much faster than on the smartphone too. In everyday life, working with the Xperia Tablet Z4 proves to be pleasantly smooth and fast. General navigation and operation are fluid and responsive. Gaming and multi-tasking are also managed well by the Z4 tablet's GPU and RAM. It's hard to find fault with the Z4 Tablet in terms of performance. The stereo front-facing speakers found on the Z4 Tablet have decent bass and volume and would be perfectly sufficient for throwing a bedroom party. Of course, you can't expect hi-fi quality but as far as tablet speakers go you'll be pleasantly surprised. Sony also affords the user a lot of audio tweaking that other tablets do not. One other thing to note about audio on the Sony Xperia Z4 Tablet is that is is equipped with LTE. That means a SIM card and that mean you can make phone calls with it. But in order to make calls properly, you should really get some good headphones, whether Bluetooth or wired, because otherwise calls are always pumped through the external speakers. For reasons you can probably imagine, this may not be ideal for your surroundings. You'll also look super goofy making calls with a tablet. Starting with the front-facing Sony Xperia Z4 Tablet camera, which has a resolution of 5.1 MP, we're already off to a good start. The selfie camera has a nice wide angle lens so you can fit more in of your group selfies but it's also useful for video chatting. There's also some fun front-facing camera modes, like AR Mask and face-in-picture (for capturing landscapes with a selfie). The main camera on the back has a resolution of 8.1 MP, but, alas, no LED flash. Taking photos in poorly lit or dark rooms is therefore a waste of time. But in all honesty, you're probably not very likely to be relying on your tablet for taking photos on the move anyway. And if you are, you probably shouldn't be expecting Pulitzer Prize winners. Again, we want to stress that we didn't see any processor-related heat problems in the camera app. Whatever the reason (we'll update this review once Sony gets back to us on the CPU question), we played around in the camera app for ages, checking to see if the Z4 Tablet suffered from the same issue, but we found none. This is very good news for anyone concerned about reports on the Xperia Z3+ camera issue. Sony packed the Xperia Z4 Tablet with the same sized battery pack found in the Z2 Tablet: 6000 mAh. While we're always wanting larger and larger batteries, Sony simply couldn't squeeze a larger one in in such a slim design. Nevertheless, the Xperia Z4 Tablet battery lasts roughly two days with relatively heavy usage. If you're watching solid video non-stop you'll get well in excess of 12 hours usage. To give you a real-world example, on full screen brightness and with plenty of background syncing and the occasional diversion to Facebook and Twitter, after watching a full 150 minute film, our Sony Xperia Z4 Tablet still had over 75 percent battery remaining. Of course, the battery life greatly depends on your own personal habits. If you keep your screen brightness right down you'll get longer battery life. If you're a hi-res gaming freak you'll get less. If you use LTE constantly, make calls, run endless apps and keep your screen at 100 percent you'll kill things pretty quick. There are certainly tablets with better battery life, such as the Samsung Galaxy Tab S 10.5, but that's a 70 grams heavier tablet that also has a larger 7,900 mAh battery. We'd have to say that Sony has done a stellar job on the Z4 Tablet battery. It's small enough to be ultra-light and portable, big enough to get you through what it needs to and also has Sony's great STAMINA mode for those moments when you need an extra couple hours of juice. Sony Xperia Z4 Tablet - where to buy? Have had this for 2 weeks, your review is accurate except for sound, which is weak. Also here in USA on ATT can't make calls from it. Maybe my settings are wrong. Any idea? I just purchased an LTE +Wi-Fi version.. waiting for delivery in 2 days ..you will have my thoughts in 3 days maybe 4 days time... be patient!